Last week was half term for everyone in my family except me. To be fair, I chose not to go skiing and instead stayed at home (when I wasn't working, of course), watched more movies, played more video games and did a bit more training than I would usually do. As I was meeting up with the family in Granada at the weekend and taking my bike there was out of the question, I decided to take the Thursday and Friday off work and get my 2 hour brick session in during the morning. It was quite a hectic day in the end, as shortly after my 50 km bike + 8 km run I had to shower, pop in to work for an unmissable meeting, catch a train into town to meet up with a friend visiting from the UK and then catch another (4 and a half hour) train down to Granada. I had to run (literally) from one appointment to the next but it was one of those days I enjoy, having a chance to do a bit of everything and feeling busy. I went for a couple of runs around Granada. It was quite a challenge to avoid those "annoying hills" but I managed to invent a 50 minute flat course on the fly by following the river (slow moving rivers tend not to go up or down hill). It was drizzling slightly on the Saturday morning and the pavements were slick and slippery: it was a challenge in itself trying to keep upright while not running in to people. 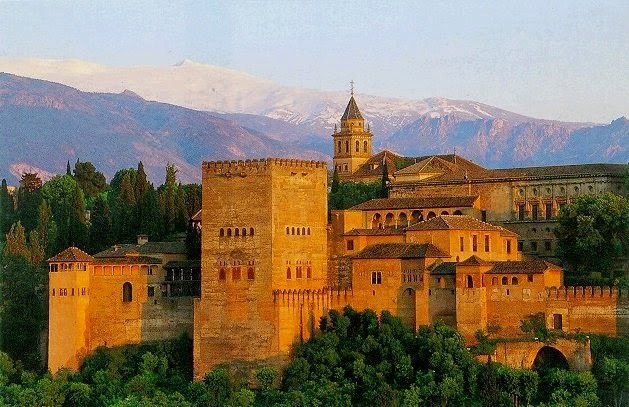 With a bit more planning I could have designed a much more picturesque (albeit hilly) route around the Alhambra. Instead, we explored the area with the kids (who are adverse to walking) on Segways which was a lot of fun and surprisingly challenging to navigate the twisty and narrow paths that were laid many years before Man came up with the idea of the Segway.